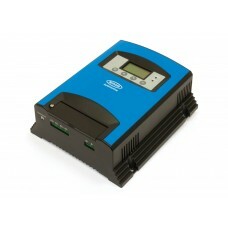 The DC-DC Smart Charger is able to take power from the main vehicle battery or solar panel, then provide a multi-stage output to quickly and fully charge an auxiliary battery. As an alternative to split charge relay systems it can provide a faster, more intelligent charging solution. Programmable for most battery types, it has a three stage smart charge output for optimal battery performance. Compensates for high voltage or a drop in voltage to maximise charge to auxiliary battery. To protect main battery, it features low battery shut off and sleep mode to reduce battery strain. Solar panel input with MPPT feature (with Max 50VOC) for charging at rest . Includes temperature compensation. Applications include utility vehicles, vans, motorhomes, caravans and boats.